Hair Extensions | Stylistic Inc.
Why does my hair keep falling out and where does hair come from in the first place? These are questions our clients often ask us. Knowing the answers to both can be very important when it comes to deciding on services like extensions or wigs. By the time we’re born, we already have 5 million hair follicles on our body—1 million on the head alone. The follicle itself is made up of what’s known as the papilla, which is tiny blood vessels that feed the follicle, and protected by an inner and outer sheath, which is where the oil and scent glands meet. The hair is made up of keratin, which is a dead protein, so the hair that you see is actually not living. How does our hair grow? The reason why our hair is growing in the first place is because the cells underneath the follicles are dividing rapidly, faster than most cells, causing new hair to extend out or replace old hair. Humans are unique for our hair growth; it sheds and grows at random, rather than seasonal or cyclical, like most mammals. When it does grow, its pace is typically .3 mm a day, or 6 inches a year. Did you know that we normally shed around 100 hairs a day? Usually these hairs are in their telogen phase, a resting period when the hair has grown the most it can, and is likely to be replaced soon. There are many reasons why people lose hair. Reasons can range from simple to temporary, a vitamin deficiency, to more complex reasons such as an underlying health condition. 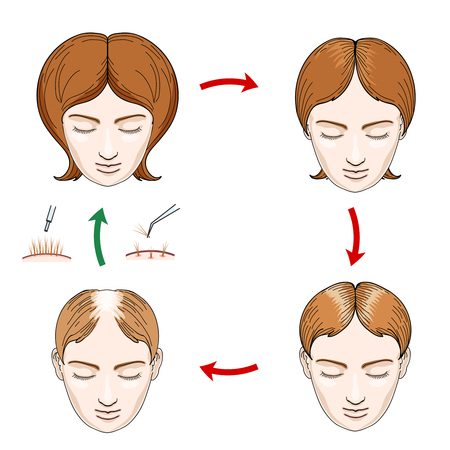 Clients who have patterned baldness are producing weaker hairs, which eventually just stop growing in some areas. At Stylistics Inc., we offer a wide range of services for clients, including wigs, hair replacements, or extensions, and can help with any questions or concerns you may have. But the cause of your hair loss should be diagnosed by a doctor first before you consider any alternative. That way, you can figure out exactly how we can help! Call 602-234-3381 today to schedule an appointment.